Well, there goes another City legend. A player who’s been with us for 12 years. A player who’s worn our badge, so proudly on his chest, an impressive 348 times. A player who’s been criticised, slated, left out in the cold. A player who’s shown unrivalled resilience and perseverance to fight his way back in. He’s basked in the glory of the most incredible highs. He’s shown bravery and taken responsibility in the face of the most agonising lows. He’s never hidden away, never shifted the blame. If the fans were hurting, he was too. Say what you want about Joe Hart, but the man is a true Manchester City hero. Virtually his entire playing career has been spent at the Etihad, even if he was sent on loan a few times in search of game time. Even when things looked bleak, our most loyal of servants just didn’t want to let go. That’s why it’s so unbearably sad to finally see his time come. Things just haven’t worked out between him and Pep Guardiola. He’s wrestled the City number 1 jersey away from fierce competitors before, but I don’t think it was ever going to happen again. His playing career here, regrettably, is over. Yes, it’s been an unceremonious few years for the former England keeper. He’s been sent to Italy for a season, then down to London, where each and every mistake has been laid mercilessly bare for all to deride. And it seems, for some reason, people have been all too happy to enjoy his misfortunes. Maybe it was that infamous shampoo advert, maybe his loud and confident demeanour – I’m not sure. The fact is, Joe Hart’s magnificent achievements and exceptional courage and commitment seem to have been largely forgotten. This is a huge shame. So, I’m here today, to hopefully remind you of his brilliance. To take you back through the years to relive Joe’s finest moments, to help you appreciate the pivotal role he had in taking our little old club to the most dizzying of heights. The last few years have been slightly awkward, but let’s not allow them to haze our vision. His contributions have made us the club we are today. One of the sweeter things about Joe’s story is that it all started off so innocuously. A reported £600,000 was all it took to draw the young keeper from his home-town club of Shrewsbury Town. His arrival, with the likes of Andreas Isaksson and Nicky Weaver knocking about, went almost completely under the radar. He did play one Premier League game in his first season with the Blues, as an emergency stand-in against Sheffield United, before he was loaned out to Tranmere and then Blackpool. Joe then had a two-year stint as City number one after the arrival of Sven-Goren Eriksen, before Shay Given was signed in 2009, taking over shot-stopping duties from the Englishman. Hart, having been demoted to the bench by the new signing, was sent out on loan again, this time to Birmingham. After a tricky start to life in the Midlands, Hart put together a string of remarkable performances, catching the eye of new City boss Roberto Mancini. The keeper finished the 2009/10 season with a place in the PFA team of the year, and, upon his return to City, a slight edge over Shay Given in the battle for the number 1 shirt. He was given his chance to impress in the opening game of the season away to Tottenham. This, many will say, is where his City career really began. His performance that day was stunning, as he helped a leaky City defence keep a clean-sheet against an all-guns-blazing Spurs – who, by the end, couldn’t believe they hadn’t won the match. Stunning saves to deny Crouch and Defoe, along with maybe his greatest save in a City shirt, an incredible leap to tip over a deflected Assou-Ekotto volley, helped the Blues crawl to a hard-fought away point. Hart’s afternoon was later rewarded with City’s Performance of the Season award – his first of many City accolades. Amazingly, Hart went on to win the Golden Glove that year as well as break the club record for the most number of clean-sheets in a single season. He also helped City to their first piece of silverware in 35 years, producing a vital stop to deny Dimitar Berbatov in that crunch Manchester Derby at Wembley, before keeping another clean sheet in that historic FA Cup final of 2011. 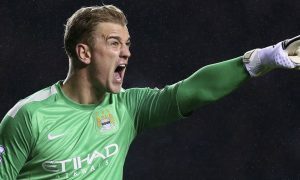 From then on, Hart’s status as City’s main goalkeeper was more-or-less constant, excluding a few weeks in the 13-14 season where he was replaced by Costel Pantillimon after a dip in form. There were, inevitably, a few mistakes from Hart during this time, most notably a miscommunication with Matija Nastasic that allowed Fernando Torres to grab a last-minute winner for Chelsea. No, his five mega-seasons certainly weren’t utterly faultless, but they were damn close. A record-equalling four Premier League Golden Gloves speaks for itself – at his prime, there were few better goalkeepers in world football. The memories from his spell on top of the goalkeeping world just roll off the tongue. He produced some of the most breathtaking saves the Premier League has ever, and indeed, will ever, see. Who could forget his gut-busting 100-yard sprint to spectacularly deny Wayne Rooney’s half-way-line strike, miraculously punching the ball just wide of the post? Or how about that crucial finger-tip to push Steven Naismith’s low shot just wide of the post in that all-important game at Goodison Park? Then there’s Payet’s marvellous free-kick, destined for the top corner, or, my personal favourite, that gravity-defying leap to tip Nacho Fernandez’s header over the bar away to Swansea. But, as we so often say, the hallmark of a great player is the ability to perform in the biggest of games – and its fair to say Joe had quite a knack for that. He made the Champions League stage his own on a number of occasions, with simply incredible performances against Borussia Dortmund, Monchengladbach and Barcelona springing to mind. The latter, on a night at the Nou Camp where Messi, Neymar and Iniesta were at their twinkling best, I regard as one of the most astounding goalkeeping performances I’ve ever had the pleasure of watching. His penalty-saving record isn’t bad either. Not many keepers can boast having kept Frank Lampard, Lionel Messi and Zlatan Ibrahimovic, amongst others, out from 12 yards. The pressure riding on some of those spot-kicks too, heroic. There’s quite simply no denying his talent, but what takes Hart to the next level of club legend, for me at least, is his unwavering passion. Just look at his reaction to Aguero’s QPR winner. Those images of him, arms aloft, in sheer euphoria, remain some of the most iconic in the club’s history. His voice, barking out instructions from his goal, was an ever-present, as long as he was on the pitch. Remember that hilarious clip of him getting a bit annoyed, shall we say, at Mangala? We’ve all been there, haven’t we? And even in the more difficult moments, as I mentioned briefly at the beginning, it was Joe Hart who stepped forward and faced the media. Go back and watch his post-match interview after that heart-breaking 1-0 Champions League semi-final defeat to Real Madrid. His words are frank, but honest. His face is well and truly etched in pain and disappointment. He’s not quite the last of a dying breed, but his exit, along with Zabaleta’s two years ago, will be felt in the ‘True Blue’ department. He was a special servant to the club, the likes of which are becoming more and more rare in today’s game. The passion he showed, both on and off the pitch, should be cherished. If anything, though, City’s recent success has taken the limelight away from his departure somewhat. City have moved on to bigger and better things now, but that should take nothing away from his work in laying the foundations for that to happen. His replacement, at the hands of Pep Guardiola, was ruthless, but ultimately justified. His work at City is done, and greatly appreciated at that. Joe Hart has never had a bad word to say about City. It’s only fair that, in his lamentably understated departure from our club, that none are said about him. Good luck Joe. You will be missed by all at City.